Heidi’s enthusiasm is contagious, and I could tell right away that she brings something special to education. Learning a language can often be a laborious experience leaving a wake of frustration for the learner (at least it has in my own experiences with language learning), but not in Heidi's French class. Here’s her story about how she brings the world to her classroom each day. I had the pleasure of connecting with Ava through my work with Participate. I was helping to pilot a new professional development program, and Ava was one of the brave teachers who took a risk and learned alongside her students as they looked for ways to make their school lunch healthier through multiple student-driven avenues. I was immediately impressed with her motivation and excitement toward teaching and learning and her openness to feedback. Here's what Ava believes about education and what she's been up to since I last worked with her. I believe that teaching is the foundation for all other careers which requires compassionate and patient individuals who have a passion for scaffolding students and imparting knowledge. I feel that it is the ability to help others to acquire new information, competencies or values and implementing specific interventions to help students who need support to learn particular things. I also believe that teachers are born and not made. I know that I am an outstanding teacher because I am able to connect with and relate to my students to bring out their true potential. I also do not crumble under pressure or when I face obstacles instead I persevere. I am intrinsically motivated, and the reward I find in teaching is the personal satisfaction I obtain when I see students learn something new and achieve academic success and development. Being a part of the Participate international teaching program has been a very fulfilling and life-changing experience, and I recommend more teachers to gravitate towards this adventure. My decision to join participate was due to several reasons. First, I wanted to share my culture by acting as a Cultural Ambassador so people can learn the uniqueness of my Jamaican culture as well as learning about other cultures. Secondly, I wanted the opportunity to travel the world, meet new people and build partnerships with stakeholders in the education system. Besides, I would be able to learn new strategies so that I may share with colleagues back home, learn about different technological devices, apps, and sites that may be used to boost students' engagement and learning. Finally, to grow professionally as an educator. Reflecting on my journey thus far, I can safely say that I have achieved all of these goals and have grown into a productive Global Educator. Currently, I have been assigned the role of Local Advisor. I have been granted the opportunity to guide two new Participate teachers and help them to transition smoothly in their new job position. As a local adviser, I serve as a mentor to new international teachers and share my own experiences, cultural opportunities, and ideas on how to be a successful exchange visitor teacher and cultural ambassador of their country. To be a successful exchange teacher, one has to capitalize on both human and physical resources present within the walls of the school to maximize students' full potential, improve one's self as a Global Educator and adjust to the school's culture and climate. In my first year, I worked closely with the Academic coach to plan classroom routines and school-wide management procedures. The use of technology in my lessons made my work as a teacher easier because I am able to allow students to direct and take control of their own learning by conducting research, become involved in Project Based Learning, and participate in online quizzes. I researched different sites that I may use with students to boost active engagement and learning. I share students' work on Twitter, send emails and write letters to pen-pals in Jamaica and other countries like Mexico. We participate in video calls with students from Jamaica sharing culture or concepts learned, and we have even video called resource persons from Nigeria. In addition, I try to globalize my lessons as much as possible. Students enjoy learning about other countries, and this makes learning more authentic and meaningful. I also collaborate with grade level teams to focus on differentiated learning opportunities for students to meet students where they are at. We also gather suitable resources and plan effective and developmentally appropriate instructional lessons and strategies. We progress monitor students and use data to set grade-level goals and identify students who need tier 2 or tier 3 interventions. I have learned so much throughout my journey as a Participate teacher, and I have enjoyed sharing and showcasing my culture. My students and I participated in a Last Year's Winter Celebration (December 2017) where were attired in Jamaican costumes and paraded for parents and community members to view. We also did a presentation where we sang Jamaican Christmas Carols like "Christmas a Come me Waan me Lama." My colleagues, principal, students, and parents were fascinated by the performance, and we received positive feedback. This was the perfect opportunity to connect with the school community and bridge the gap between home and school. Ava’s students learning about Jamaican culture. We also prepared a Jamaican display for all to view, ask questions and learn about the Jamaican culture. Students seem to be eager to learn about other countries and cultures so by globalizing lessons this makes the teaching and learning process more meaningful and interesting. I have also done research and read about schools that have shown marked improvements in academics because of the inclusion of Global Education to the curriculum. This has helped me to develop a new level of understanding and depth to my teaching. I have made a positive impact on my school and living community by allowing each stakeholder to develop vicarious experiences about my culture. In data meetings or team meetings, I help to include information about the Jamaican culture in our lessons. I also bring colleagues and community members Jamaican souvenirs, teach songs and stories from my culture and share past experiences about my country. I mount multiple display boards showcasing the Jamaican culture in the classroom, also during culture night and market day celebrations. 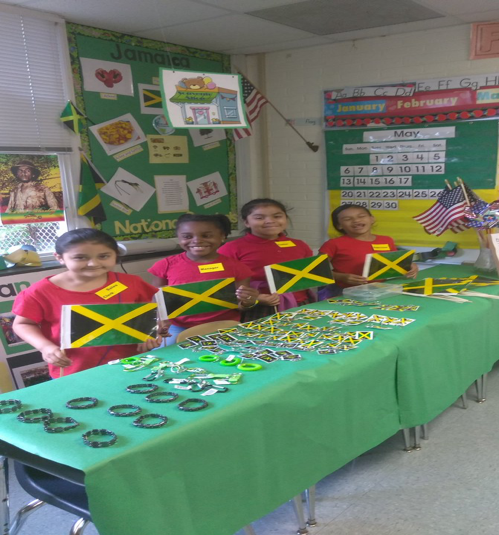 For Market Day this past year, my students and I made Jamaican souvenirs such as key chains, flags, and bracelets. We were also mentioned in the Time News. You may click here to read the story. Being a teacher means demonstrating the ability to provide authentic, engaging, meaningful and cultural learning experiences to cater to the needs of diverse learners. It also means equipping students with effective and efficient skills needed to function in a global society. I have learned to do this through imparting knowledge, skills, and attitudes required to be a global citizen, giving students the opportunity to build vicarious experiences and travel the world through virtual exchange. The world is becoming a smaller place due to advances in technology and mobility. Hence, students need to be globally prepared, develop self-awareness, cultural understanding and empathy so that they will be able to appreciate others and their culture. As Global educators, we should incorporate Global Instructional Practices used to integrate global concepts and lenses in the classroom meaningfully. My continuous participation in Professional Development activities has boosted my self-confidence and determination as an educator. When I return home to Jamaica, I also plan to conduct workshops to impart some of the fabulous strategies and interventions that I have learned here. I have already started sharing best practices with some of my colleagues back home, and they all seem to be loving them and are trying new things in their classroom. Ava-Gaye Blackford currently teaches second grade dual immersion in North Carolina. She has been an educator for twelve years and serves as a peer reviewer, mentor, and local advisor for beginning teachers through Participate. She has earned a Master’s Degree in Educational Administration and Leadership and a Bachelor's degree in Education from The International University of the Caribbean in Jamaica. Connect with her on Twitter @BlackfordAva. If you haven’t read part 1 of Jeff Zanger’s story, please read it first. In his previous post, Jeff Zanger shared a very personal story about his life and the death of his son Easton. In this post, Jeff continues his personal JRNEY that takes him all over the world to become the global educator he is today. I met Jeff at ISTE18. He sat next to me in a meeting about global collaboration. What he didn’t realize at the time was that he gave me a very nice compliment about a curriculum I had developed while working for a global ed. company the year before. I had a chance to chat a bit with Jeff during the conference and could tell right away that he was a passionate global educator. What I didn’t realize was the incredible story he had to tell. There’s so much we can learn from this story, so I decided to split it into two posts without having to cut anything. I hope you are inspired as much as I have been. Here’s part 1 of Jeff’s story.